Eddie Butler was solid in his Cubs debut, he worked two innings giving up one run on one hit while striking out one. Ryan Williams was outstanding in relief, he worked two scoreless innings, giving up one hit. Jon Martinez struggled with command, he worked a scoreless inning while walking THREE, and striking out one. Mario Meza worked two-thirds of an inning, he walked one and that was it. Tommy Nance had a bounce back effort, he worked a scoreless inning while striking out one. Duary Torrez was touched up a bit, he worked one inning, giving up one run on two hits while striking out one. Juan Paniagua also struggled with his command, he worked one inning, giving up one run while walking THREE. Javier Baez went 1-for-3 with a run scored, he’s now hitting .364 on the spring. 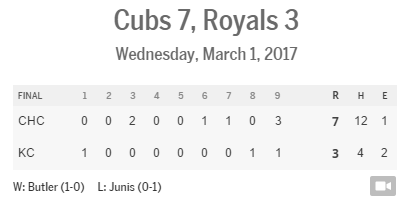 Ian Happ was 1-for-2 in the win, he stole a base, and scored a run. John Andreoli, Jacob Hannemann, Jeimer Candelario, Chesny Young, Albert Almora Jr., Eloy Jimenez, and Chris Dominguez all registered one hit, Jimenez with a double, and Andreoli with a triple. Victor Caratini was strong once again, he went 3-for-4 with a run scored.